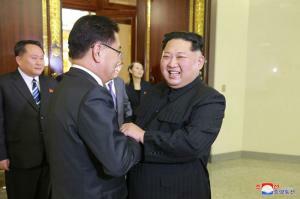 March 8 (UPI) — President Donald Trump agreed to meet North Korean leader Kim Jong Un for denuclearization talks by May, a South Korean envoy who facilitated communication between the two said Thursday. Chung Eui-yong, South Korean President Moon Jae-in’s national security chief, said Kim offered to halt nuclear and ballistic missile testing and production in order to facilitate the proposed meeting. The envoy said Kim is “committed to denuclearization” and that he understands routine joint military exercises between South Korea and the United States must continue. The announcement comes after a South Korean presidential delegation that met with Kim in Pyongyang traveled to Washington, D.C., to deliver a top-secret communication from Kim to Trump. Before the Washington meeting, Chung said the main aim of the delegation’s U.S. visit was to build trust with the United States regarding potential dialogue. The alarming level of missile development and claims North Korean rockets could hit parts of the continental United States has drawn strong responses from the Trump administration. The United States has said denuclearization is a condition for talks. Kim, a reclusive leader who has never left his country for official visits, revealed much about his personality to the South Korean delegation this week, according to the presidential Blue House. Elizabeth Shim contributed to this report.